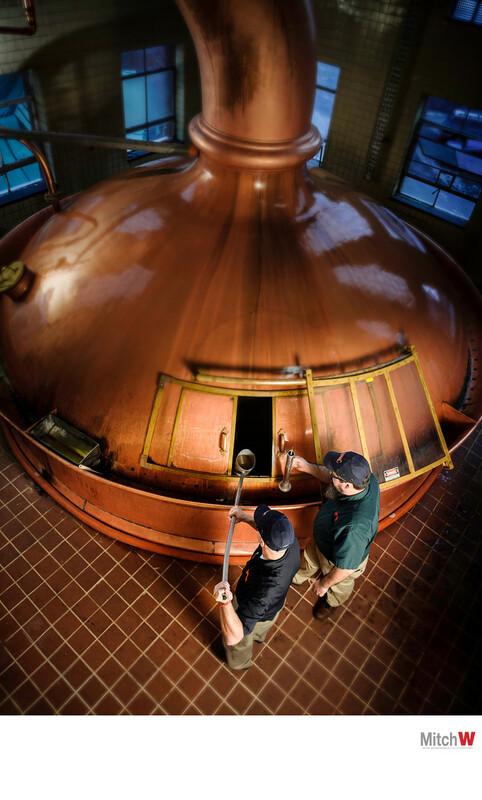 Two brewmasters at Saranac brewing in Utica New York take samples of beer being brewed at the historic brewery. Photographing the operations of a business is my key focus as a New York annual report photographer. It’s all about the people, the processes and the settings. You need a photographer with the skills and visual agility to cover it all for you. Looking for the best annual report photographer in Saratoga Springs? With many decades of experience as a full time professional photographer, I am able to visualize images, such as this, from a routine industrial setting. I am also able to add supplemental lighting quickly, having read the natural lighting available to me at the scene. Many decades working as an annual report photographer have giving me a keen understanding of natural lighting and how well it will translate into a final image for your marketing photography needs. I understand how to then add supplemental lighting to create a dramatic, or even just a nicely executed clean photograph. And this can be done quickly and with minimal disruption. After all, these aren't photo illustrations we are creating. They are images that communicate how your people work, what you do, and ultimately the values behind your company. In sizing up the scene I am able to find interesting and unique angles that best present my subject. The goal is to create a dramatic photograph, one that will make your viewers stop and look. With great imagery you can quickly present you're message to your target audience. So often I hear from potential clients looking at my portfolio that “we don’t have anything that looks like that here”. I love being able to tell them “neither did they”. What a top annual report photographer in Saratoga can do for you. I help put the face on your business. And I help you communicate what you do for your customers, Helping you strengthen your relationships with them. Making an actual photograph today is so much easier because of technology. That leads many people to believe the taking a photograph is a simple task. In fact, it is. But we're not taking simple photographs here, We're not making a simple record image, “taking” a photograph. We're trying to make an image that communicate something about what you do, or who you are as a business, or what your values are. We’re creating visual communications. A great photograph doesn't tell you the who, the what, or the where. A great photograph communicates the why to your audience. And when you communicate the why, you have connected with your target on a much deeper level. So if you were looking for a photographer in Saratoga, or you need a photographer anywhere within a hundred miles of Saratoga Springs NY , or are looking for an upstate photographer please give me a call today so that we may discuss your next project. I travel anywhere and I'm able to handle a wide variety of challenges in creating great images for you and your communications needs. Let's talk today about your next project. This Link will take you to my contact page. I enjoy hearing about possible commissions, even if they are in the super early formulate stages. With my decades of experience, I’m sure I can ask at least one question or offer one observation at this preliminary stage which will help your project planning move that much smoother. Thanks and I anticipate hearing from you soon! Location: Saranac Brewery Utica, NY.